Drying apples is the best way to preserve them without refrigeration. They are delicious dry as it really concentrates their flavor, but they can also be re-hydrated and will make a pie or applesauce that is indistinguishable from that made from fresh apples. Indeed, many recipes we looked at in old cookbooks called for dried apples, even though fresh ones were available. Some apples were especially valued for drying, usually those with a tart flavor that would ripen in the heat of summer and make good pies. In the American South many roads were dirt before 1950, and they became impassible during heavy rains. Apples needed to be processed near where they were grown, as 25 kilos of fresh apples could be dehydrated to make 4 kilos of dried apples. These were packed into gunny sacks in small batches and collected by merchants and co-ops, and distributed by wagon and railroads and exported. 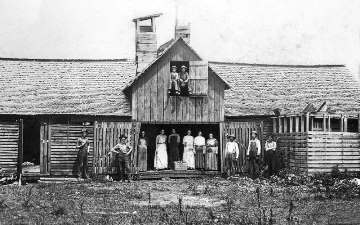 Dried apples were a source of badly-needed cash for rural farmers in the desperate years after the American Civil War; in 1879 3,311 metric tons of dried apples were exported at $0.05 per half kilo. 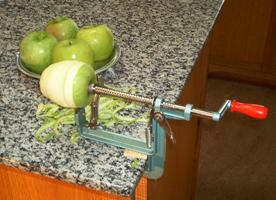 Large quantities of apples had to be peeled, cored, and sliced. 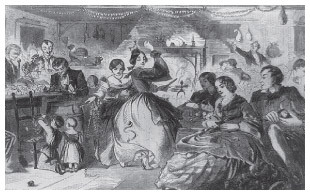 People used to get together for "paring bees" where they would make a social occasion out of it. It was also a pastime to sit on the porch with an apple and a knife and peel the apple with a single long, thin peel; the world record apple peel was done by 16-year-old Kathy Wafler Madison at over 57 meters. It was also said that if a young lady threw an apple peel over her shoulder, it would land forming the initial of her future husband. 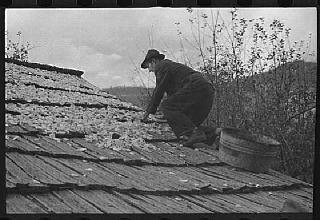 Later on many apple peeling machines were invented; they will peel, core and slice the apple. The one on the left is common today for small batches. Below: apples were dried in any number of ways; the simplest was to spread them on the rooftop; it was often the children's job to tend to them and keep them covered in cheesecloth to protect them from insects. 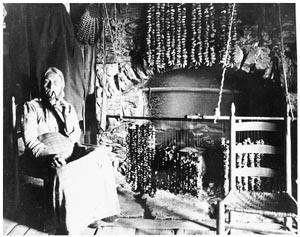 In bad weather or winter they were strung on strings and hung from the ceiling or in front of the fireplace. Below: larger farms would have their own wood-fired drying shed where they dried fruit and meat. Later some towns would have a communal oil-fired drying facility called an "evaporator" like the one on the right. Below: by the early 1900's dried apples were big business and large evaporators were located near railroad tracks to better distribute them to shipping agents and ports for export; this photo was from 1907 and teh facility was considered state-of-the-art. Rather than using firewood or oil, we think that the hot tropical sun should be employed to dehydrate the apples, and there are some excellent designs available for this. Below are two sources we've found with increasing sophistication. We believe there is great potential for this, as just in the Old South it would allow processing to take place near the growers and limit the need for refrigerated storage and shipping, making a durable product that could be sold far from population centers.